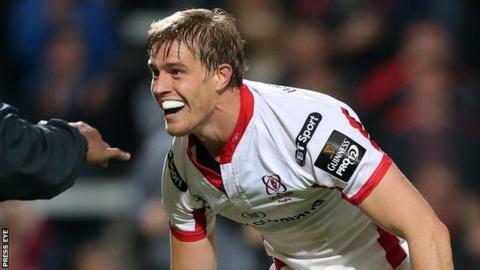 Winger Andrew Trimble will miss Ulster's European Champions Cup opener with Leicester Tigers after injuring a toe in the Pro12 win over Glasgow. The Ireland star had a scan and has been ruled out of Saturday's Pool 3 game at Welford Road with Craig Gilroy taking his place. Lewis Stevenson comes into the second row because Alan O'Connor is suspended. Paddy Jackson is fit and available after injury, but Ruan Pienaar has not recovered from a knee injury. Prop Marcos Ayerza is recalled to the Leicester starting line-up after making his first club appearance of the season as a second-half replacement last Friday at the conclusion of international duty with Argentina in the Rugby Championship. He returns to join Leonardo Ghiraldini and Fraser Balmain in the front row. The call-up for Ayerza is the only change to the team that started the win over Harlequins last weekend as Tigers return to home turf for the opening of the new European tournament. Gilroy scored a try after replacing Trimble in Saturday's 29-9 win in Belfast. Newly appointed Ulster head coach Neil Doak will take charge for the first time in the European encounter. Pienaar sustained the knee injury in South Africa's Rugby Championship match with New Zealand last month. The 30-year-old suffered the injury after an accidental collision with team-mate Duane Vermeulen, so Paul Marshall - who impressed against Glasgow - will start in the number nine shirt. Pienaar scored all of Ulster's 22 points in their three-point win against Leicester in the Heineken Cup in January, a result which ended the Tigers' unbeaten home run of 25 matches in the competition. That outcome completed a double for the Irish province, with Ulster having triumphed 22-16 at Ravenhill earlier in the season. Ulster have reached at least the last eight of the now defunct Heineken Cup for the past four years and are currently third in the Pro12 standings thanks to four wins, one draw and one defeat. Leicester lie eighth in the Premiership but the return of England centre Manu Tuilagi inspired them to a 22-16 success over Harlequins on Friday. The Tigers had failed to win a match in his absence and that victory ensured that they avoided losing four consecutive Premiership games for the first time since October 2003. They have also been boosted by the return of prop Marcos Ayerza after international duties with Argentina.